The ASP.NET Web Forms Rich Text Editor control is a feature-rich, WYSIWYG HTML editor that provides the best user interface for creating and editing content. The ASP.NET Rich Text Editor is a lightweight WYSIWYG HTML editor that provides the best user interface for creating and editing content. It returns valid HTML markup format content. The Rich Text Editor provides a wide range of tools from the toolbar to make the best WYSIWYG editor. The ASP.NET Rich Text Editor control can be used as a WYSIWYG HTML editor. It allows users to view and edit content as HTML markup and to view the HTML source using the Code View icon. 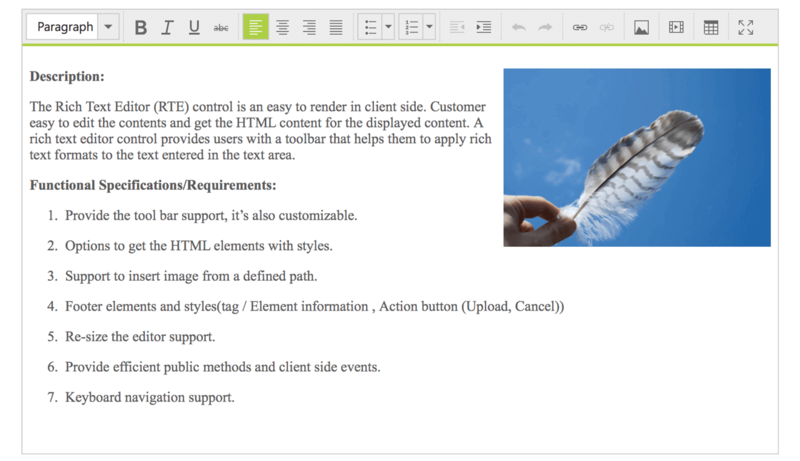 The WYSIWYG HTML editor toolbar provides a variety of commands for editing and formatting the content. You can format text, paragraphs, insert images, insert hyperlinks, insert tables, insert lists, etc. The tool commands are grouped together based on related functionality. You can insert and edit HTML tables to display grid-like tabular data in Rich Text Editor. Allows manipulation of the table and its elements dynamically such as insert/remove rows and columns, resize whole table or rows or columns, and remove a table. You can insert images to your content from a local path or server path with image captions and then link URLs to the images. Additionally, you can shrink(resize) images based on your needs if the images are large. The ASP.NET Rich Text Editor clean unwanted elements and styles when copy paste from Microsoft Word or other editors. Rich Text Editor provides find and replace support, which is used to search for a keyword in editor content and replace the matched keyword with a specified text. The Rich Text Editor provides the option to validate its content. When the content modifies into the editor, it continuously checks whether the HTML source of the content that you are creating is valid. The Rich Text Editor support to import a word document into the editor area and export the Rich Text editor content to PDF and Microsoft Word formats. The ASP.NET Rich Text Editor recognizes touch gestures, allowing the user to swipe left or right to move the toolbar. The responsive, mobile friendly design provides the best user experience on all mobiles, tablets, and desktop form factors.